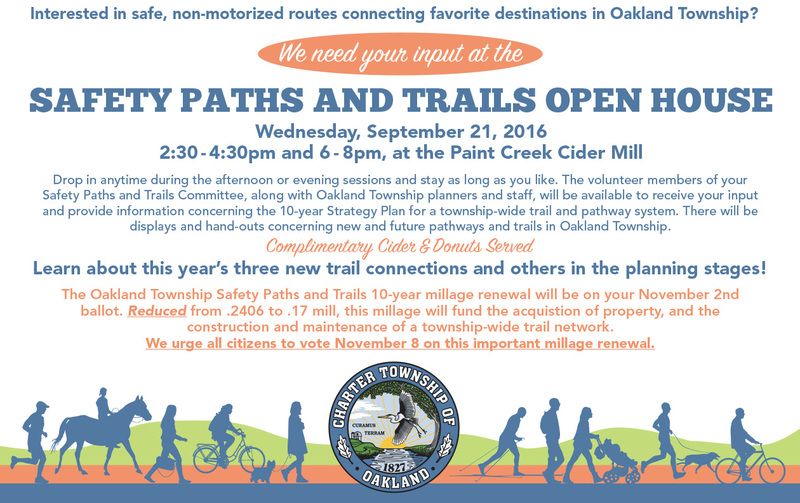 Oakland Township’s Safety Paths and Trails Committee has been working on improving the paths and trails network within our Township. They have scheduled an “Open House” for September 21 between 2:30 PM and 4:40 PM, and 6:00 and 8:00 PM, at the Paint Creek Cider Mill. The purpose of the Open House is to gather resident input on our current and future path and trail system. Input is desired from all types of trail users. There is no formal program, so feel free to drop in at any time during the two hour periods to review what has been done to date, and provide input on the direction Oakland Township should take on our Township wide trail and path system. Free Cider and Donuts will be served. MARK IT ON YOUR CALENDAR FOR NEXT WEDNESDAY! This entry was posted in Uncategorized and tagged Safety Paths and Trails on September 15, 2016 by richardjmichalski.